Now that Scout weighs 13 pounds, I discovered carrying Scout in one arm and holding up my maternity pants with the other would soon no longer be feasible. With 15 pregnancy pounds still lingering, mostly in my hips and thighs, I went shopping for new clothes. 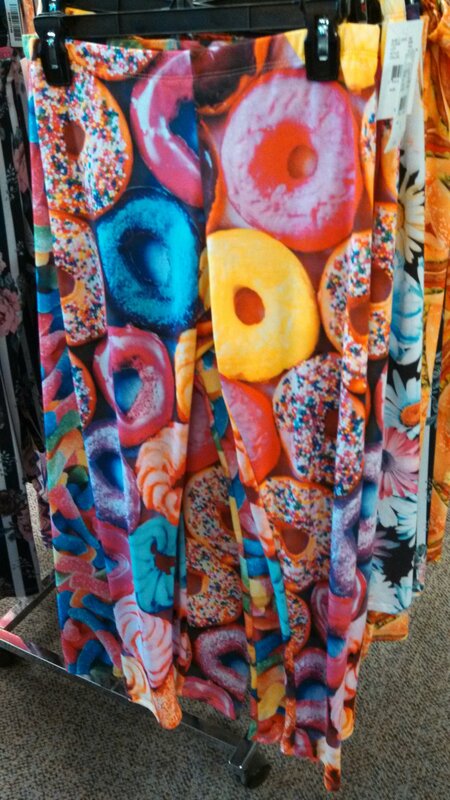 I just came home with jeans and shorts, but I’m considering going back for these doughnut pants. Not feeling the doughnuts? There were cheeseburger pants as well. Please tell me you’ve seen someone wearing these or something similar. Haaaaave you met Jules? I can’t remember if we first bonded over our mutual love for Glee or vodka, but we definitely cemented our bloggy friendship with vodka at BlogHer. Please give her a warm welcome today. If you’re nice to her, she’ll probably make you one of her chief chipmunks. When Thoughtsy asked if I’d write a “Movies Teach Us” guest post, I didn’t hesitate. Movies have taught me so much. Thanks to the silver screen, I wasn’t long in this world before learning that killer bees really can kill, Reese’s Pieces are otherworldly-level yummy, and men fall in love with girls who actually would let you put them in a corner if it was up to them. I recently watched my all-time favorite movie for the 10th 20th 30th time, and I thought it would be the perfect pick for today. I totally didn’t even pause before picking this movie. “Showing a little skin” will only prolong your realization that yes, that hot guy who likes to shop really is gay. The correct pronunciation of “Hatians” is HAY-tee-uns. If you don’t wear your most capable-looking outfit, you will fail that driver’s test. Only yellow plaid goes with yellow plaid. They don’t speak Mexican in El Salvador. One pees his pants constantly; another farts constantly; one wipes her boogers all over everything…. You get the idea. You know what this jean vest needs? A boogie. Right here. You can get locked up for being too gross, too tall, too short, too old, and too fat (Ex. Santa. Sorry, no Christmas this year). Fashion in the 1980s was weird. I also watched Tommy Boy. Let’s have a moment of silence for Chris Farley. Brothers don’t shake hands. They hug. Putting a fat man in a little coat is a bad idea. If Housekeeping asks to jerk you off, it’s probably not Housekeeping. Next week you’re in for a real treat because I lined up some guest bloggers to do Movies Teach Us posts all week! Woo-hoo!